From a simple broken window or stained glass window set in furniture, up to the most elaborated works, ‘VERRE ET VITRAIL’ Company is able to show you our know-how. 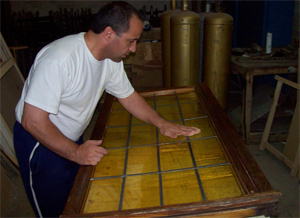 Our experience also extends to restoration stained glass church windows dating from 1850. Regarding stained glass windows classified in the French ‘Monuments Historiques’ institution, we are collaborating with Mr. Bruno Tosi, master glassworker located in region of Jura France, allowing us to expand our experience with this special type of work.